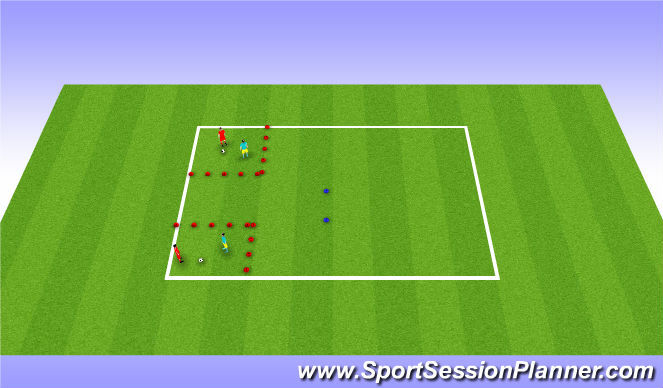 2 sets of 1 vs 1, blue player has to keep the ball for as long as they can but they cannot leave the square. If they can keep the ball for longer then for every 30 seconds they get a point. Red players have to win the ball back and break through the blue cones. Now when they break out of the red box they have a limited time to score. If the red player wins the ball back now can he pass out of the red box to his partner. It would be better to encourage the red player to repossess the ball and dribble out of the red box before playing the pass. main focus-- once having played the pass can the red player support in the attacking transition. Does the ball go forwards at all times? Now we move onto a 3vs2 upon reds winning the ball back. Aimf or them to take a 1-2 attacking shape up as they go forward. ( stress that one of the two may need to hol to provide cover.